Jeanmar Gomez.was an unflappable member of the Phillies bullpen in 2016, saving 37 games. But he didn't have overpowering stuff and struggled mightily in the season's final six weeks, making him a possible non-tender candidate. Two weeks ago, the Phillies had to set their 40-man roster in preparation for the Rule 5 Draft and, after adding a whopping 11 prospects, were at the roster limit. There’s a chance they could clear some room today, before heading to baseball's Winter Meetings on Sunday night. Phillies add former long-time GM to baseball operations dept. Major League Baseball teams have until 8 p.m. tonight to tender contracts to players eligible for salary arbitration. The Phillies have four such players: shortstop Freddy Galvis, second baseman Cesar Hernandez, right-handed reliever Jeanmar Gomez, and outfielder/infielder Cody Asche. Players that are non-tendered on Friday immediately become free agents. General manager Matt Klentak was asked about his quartet of arbitration eligible players two weeks ago. But he didn’t offer much insight into the team’s thinking. Let’s break this down player by player. The longest-tenured player in the Phillies organization will absolutely be tendered a contract today. Galvis, 27, earned $2 million as a first-year arbitration-eligible player last season and MLBTradeRumors.com projects him to make $4.4 million through arbitration in 2017. Galvis has his warts offensively – his .274 OBP was the worst in baseball – but he also hit 20 home runs and went 17-for-23 in stolen base attempts. Galvis was the only shortstop in baseball to hit at least 20 home runs and steal more than 15 bases. And then, of course, there is his defense at a premium position: Galvis was a Gold Glove finalist. Even with top prospect J.P. Crawford not far away, the Phils value Galvis’ defense, baseball acumen, and clubhouse leadership enough that he’s a candidate to supplant his current double play partner at second base. Like Galvis, Hernandez will absolutely be tendered a contract today. Hernandez, 26, is in his first year of arbitration eligibility; MLBTradeRumors.com projects him to make $2.5 million through arbitration in 2017. Hernandez has hit .285 with a .358 OBP in 282 games in the last two seasons when he supplanted franchise icon (and current free agent) Chase Utley as the Phillies' regular second baseman. Hernandez’s .371 OBP in 2016 ranked 15th best in the National League. Hernandez also graded out well in defensive metrics in his first full season as a regular starting second baseman. His only faults were an inability to take advantage of what may be his top tool, his speed (he was caught stealing 13 times in 30 stolen base attempts), and occasional mental errors. Hernandez’s offense is real, however, and he’s clearly an asset to a team in need of consistent hitters. He could also become trade bait this winter, however, with the aforementioned Galvis-to-Crawford baton relay later in the summer and top second baseman prospect Scott Kingery rising quickly through the minor league ranks. The third Venezuelan on this list, Gomez is far less certain to be tendered a contract than his countrymen Galvis and Hernandez. 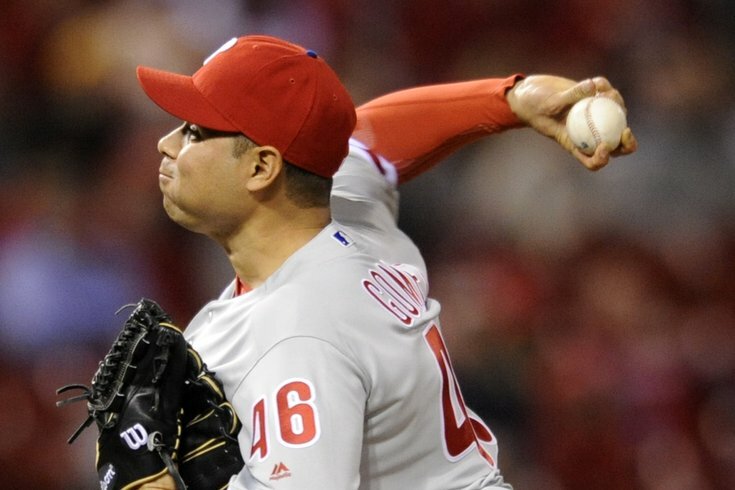 The 28-year-old Gomez, who spent the majority of the 2016 season as the Phillies closer, is a free agent after the 2017 season; he earned $1.4 million last season and MLBTradeRumors.com projects him to make $4.6 million through arbitration in 2017. Gomez certainly was effective at his job for 4 1/2 months last season, taking the closer’s job after nearly every other candidate failed in the season’s first week. He racked up 37 saves (fifth in the NL) in 43 chances. But he does not have the prototypical closer stuff (Gomez’s 6.16 strikeout rate ranked 83rd of 86 NL relievers with at least 40 innings) and he sported an uneasy 1.456 WHIP, too. Gomez lost the grip on his closer’s job in the season’s final six weeks. He had a 13.20 ERA in his final 19 games when opponents hit .403 against him with a .469 OBP. The Phillies certainly have payroll flexibility to handle Gomez’s salary (they’re already in line to pay new reliever Pat Neshek $6.5 million in 2017) but if they feel they can get an upgrade on the open market (through a trade or free agency) you can also understand why the front office might see Gomez as expendable. The front office could also look to either trade Gomez or get him to agree to a one-year deal to avoid arbitration (for less than that projected figure) prior to Friday’s deadline. Asche is about as uncertain as Gomez to be tendered today. Asche, 26, is entering his first year of salary arbitration and is projected by MLBTradeRumors.com to be in line to make $1.3 million through arbitration in 2017. Asche’s bid to prove himself as an everyday left fielder never got off the ground last year, a year that began with him sidelined for the duration of spring training and the first two months of the regular season with an oblique injury. He hit just .213 with a .635 OPS in 71 games. Asche’s best path to a roster spot in 2017 would be transitioning into a Greg Dobbs-like utility bench player, giving the Phillies a left-handed bat to complement right-handed corner outfielders Howie Kendrick and Aaron Altherr) and right-handed corner infielders Maikel Franco and Tommy Joseph. While non-tendering Asche would make some sense if the front office wanted to clear a spot on the currently full 40-man roster, perhaps to add a veteran backup catcher (no one has closed the door on an A.J. Ellis return), the team would then be lacking a veteran lefthanded bat off the bench. Even if the Phils tender contracts to Asche and Gomez, they could find room on their 40-man when they need to by designating another player (right-handers Phil Klein or Luis Garcia?) for assignment.